Sorry for the sudden disappearance from blogging.As i had an unexpected trip to Tirunelveli,i couldn't post any.I missed all ur posts too:(.Even today i am in salem and leaving to bangalore on tuesday.I will be regular from Wednesday i guess. :).I'll update this post with stepwise pictures after going there..
Ragi idli,dosa recipe using fermentation method was in my try list for long time.When i came across this recipe in Kamala's corner,i bookmarked it and tried immediately.Actually i wanted to make ragi idli without rice but as i tried for the first time,i tried the recipe as it is.Ragi@Kezhvaragu(in Tamil) has lots of health benefits.I usually make Instant Ragi dosa.But this recipe is surely a welcome change as i can make soft idlis & crispy dosas as well.Its a healthy breakfast/Dinner recipe for diabetic & people who look for weight loss.Do try this soft idli recipe.U'll love it for sure. Wash and soak the rice,dal & methi seeds together for two hours.Add the required water and grind everything all together adding required salt & water.Lastly add the ragi flour ,grind for few minutes.Remove and ferment overnight or 10 hours. The next day,batter would be doubled and sometimes overflown too.Stir well and make idlies. Steam in idli mould for 10-12 minutes till the inserted spoon comes out clean. U can make dosas by diluting the batter slightly.Make crispy or soft dosas as per ur need. Enjoy with chutney ,sambar ! For variations,u can use whole ragi grains instead of flour. If u want to try without rice,use 3: 1 ratio of ragi flour and urad dal.Add 2 tbsp of poha for softness. While making dosas,u can temper and saute onions,chillies,ginger & curry leaves as it makes the dosa flavourful .. Enjoy with ur favourite chutney,sambar ! this is a really healthy idli!!! Healthy breakfast ...looks yummy too !! Super healthy and tasty dosa!! 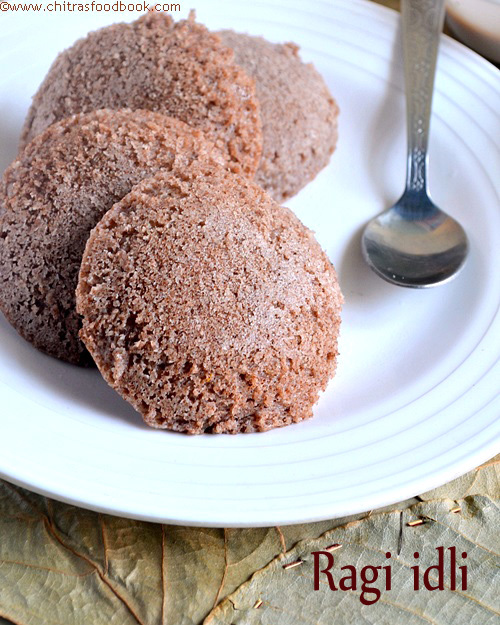 Healthy tasty Ragi idlis. Perfectly made dear. That looks like a super soft idli .Spongy idly . The fact of the matter is these idlis made out of ragi flour do not turnout to be as soft or porous as fermented idlis made out of rice and urad dal. One suggestion may be to add sodabicarb or baking powder. Just before making the idlis or perhaps use ragi grains soak and grind fermentas we do for regular way Is there any other way to make thes idlis as rice urad dal idlis, anything other than these suggestions? Please try this recipe once and let me know.It did turn out soft n porous as u see in the picture.This proportion of rice,ragi n urad dal & proper fermentation matters here :) .No need to use soda as it is not good for health. super soft and healthy idly. Healthy idlis. Feel like grabbing that plate!! super sponge idlis, like the version of mixing flour before frementation!!! today i tried this idli and mistakingly i mixed 3 cups of ragi flour instead of 2 cups and the idlies came out really missy. So, i made dosai with the remaining batter and it came out really nice. Next time, i try with correct proportion and tell the feedback. Thanks for the recipe. 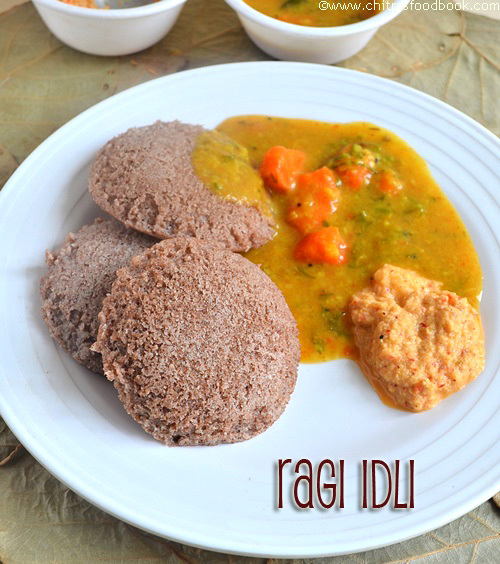 Hi chitra,I am trying Ragi idli 2dayn I have doubt to add cooking soda r not plz do reply me soon. Tnx a lot will let u know hw idlis can out. I love cooking Chitra wen I saw ur website was really very happy with recipe u have posted. Tried the recipie yday. Came out very well. Tasted yummy. Thx. Gng to try this idly tomorrow.. planning to make sprouts with whole ragi grains...gng to soak ragi grains now to get sprouts tomorrow..will comment oncE done..
Hello Chitra I want to make this batter in mixi ,I don't have grinder should I use same proportion of dal ,rice,ragi flour. Yes u can follow the same. Add 2 tbsp aval if u want. Use ice water for grinding. 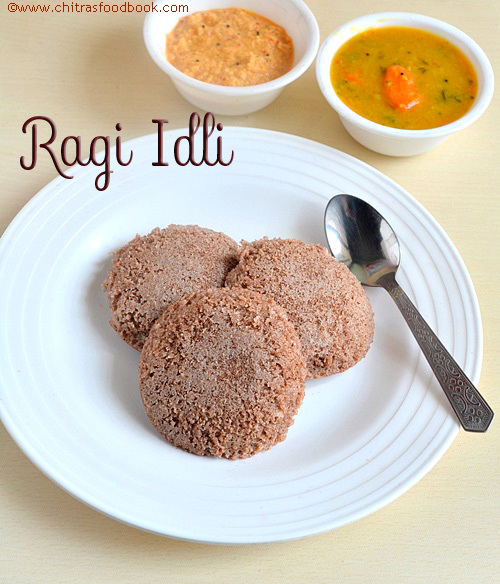 Hi, Yes you can mix ragi flour in idli batter and make this idli. But mix the batter, keep it outside for 5 hours and then make idli. It helps for fermentation and yields soft idli. Can I use idli Rava instead of rice? If so what is the ratio?